Atoms For Peace’s AMOK album is now out, and it is predictably fantastic (more later). AFP has now released the official video for the album’s Ingenue in which Thom Yorke and Fukiko Takase interpretively dance in three-piece suits and ponytails. We don’t normally go in for this sort of thing, but herein lies more mesmerizement. Check it out below. We are longtime fans of Kelly Willis (and her other singing kin). 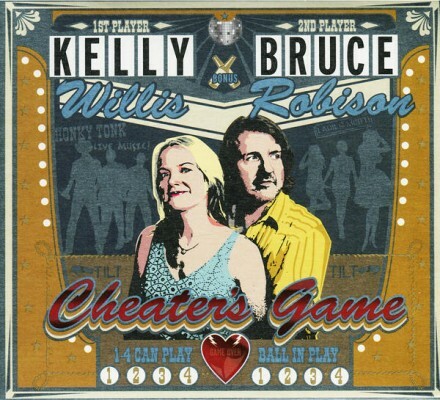 And her husband, Bruce Robison, ain’t bad either–in fact he’s a highly-acclaimed country songwriter. As witnessed below, put ’em together and you won’t be leaving the listening booth any time soon. The couple will soon release Cheater’s Game, their first album together despite almost 20 years of marriage. The new album’s songs are half covers and half originals. Watch and listen below as the duo and their band nail Leaving, a Robison-penned song from the new album. You can listen to the entire episode on WNYC HERE. Bryce and Aaron Dessner continue to give back to their native Ohio. Each year the Dessners and friends present the magical Music Now Festival in Cincinnati. We would give our senseless minds to attend each year. This year’s Music Now will run from April 12th to 14th, and the Saturday night of Glen Hansard, The Brooklyn Youth Chorus and Shara Worden (My Brightest Diamond) boggles the mind from afar. Last year’s MNF was no exception, including the likes of This Is The Kit and other kindred souls meeting within the zips and zones of Cincinnati. Check out This Is The Kit (rightfully raved over by Sharon Van Etten, Elbow’s Guy Garvey, The National, etc.) as they call forth a demon or angel three in their performance below (which includes a deft and soulful slide segment from Aaron Dessner and Arcade Fire’s Richard Reed Parry). The performance was produced by A Story Told Well & Music Now for La Blogothèque. And blessed are those who see and are silent. Indeed (must aspire). We’ve been getting most mightily filthy. Mud marks up to our necks. And they did unfold, and the wind it did fill them in the wind. And so the outside bashes us in. Feel it tugging you, ploughing you flat; then feel it filling your sails and warm on your back. Life. This Is The Kit is working on its next album, which will hopefully be released later this year, with Aaron Dessner producing. Buzz-dude Kendrick Lamar and his full band slipped into smooth last night on the Letterman Show and performed a Drake-less Poetic Justice to further stake his claim as the most poetic rapper extant. Check it out. Kendrick’s Good Kid, m.A.A.d. City album continues to draw circles. Vancouver duo Japandroids rock like few other duos do, and managed to turn heads and make the top rung of many Best Albums of 2012 lists with their phenomenal Celebration Rock album. If you haven’t seen them, they performed their song The Nights of Wine and Roses last night on Conan, and you can check it out below. We’ve heard them sound better on Fallon and elsewhere, but you get the feel nonetheless. Thanks to Corpchella, they will play Velvet Jones (with Cloud Nothings opening) on 4/15, and you can get tickets HERE. Check out below the new Iron & Wine song Grace for Saints and Ramblers from their impending new album Ghost on Ghost (out April 16th on Nonesuch Records and 4AD). You can learn more and pre-order the album HERE. Because Sam Beam’s been so saintly a songwriter in the past, we’ll give grace (for now) to this rambler. It does have a groove though. Kathleen Edwards’ album Voyageur was one of our Best Albums of 2012. It’s a gift that keeps on giving. Check out Edwards’ new video for song Chameleon Comedian off the album. It’s a gruesome video, but a soaring song. Saw-blade impalement has never sounded so good. Johnny Marr will release his first official solo album, The Messenger, tomorrow. Today you can stream the entire album on Marr’s YouTube channel HERE. For a scintillating song-sample check out the fantastic Upstarts below. The wait was definitely worth it. Marr will open for New Order on their upcoming tour, including at the Santa Barbara Bowl on April 18th in between the Coachella weekends. The Walkmen placed high in our Best Albums of 2012 with their rapturous album Heaven. Check out this ever-better band and lead singer Hamilton Leithauser recently in Seattle performing the title song (apparently not producer Phil Ek’s pick-of-the-litter–no wonder they made it the title track). After, check out Juveniles off of their fantastic 2010 album Lisbon. Both are delivered with arresting aplomb on behalf of KEXP.